Williams leads the team in receiving touchdowns with nine going into Saturday's game against Baltimore. He is coming off his biggest game in the NFL with seven receptions and three touchdowns in Thursday's victory at Kansas City. Williams leads the team in receiving touchdowns with nine going into Saturday’s game against Baltimore. He is coming off his biggest game in the NFL with seven receptions for 76 yards and three touchdowns (including one rushing) in Thursday’s 29-28 come-from-behind victory at Kansas City. “My main goal since the beginning of the season has been to be available for every game and make plays for my team. My confidence is building off of that,” Williams said. Williams became Philip Rivers’ go-to receiver against the Chiefs after Keenan Allen suffered a hip injury during the first half. That may be the case again against the Ravens as Allen’s status remains questionable. Williams showed at Clemson that he could be a big-play receiver. He caught 11 touchdowns in 2016 when the Tigers won their first national championship in 35 years. He was the seventh overall pick by the Chargers in 2017 but struggled due to back and knee injuries. Williams appeared in 10 games but had just 11 catches for 95 yards. Williams has been healthy throughout this season, however. He got off to a fast start with three touchdowns in the first three games and 15 receptions for 249 yards in the first five. He had only five receptions in the next five games, but two were for touchdowns. The past four games have represented Williams’ best stretch. He has 17 catches for 198 yards and four touchdowns. 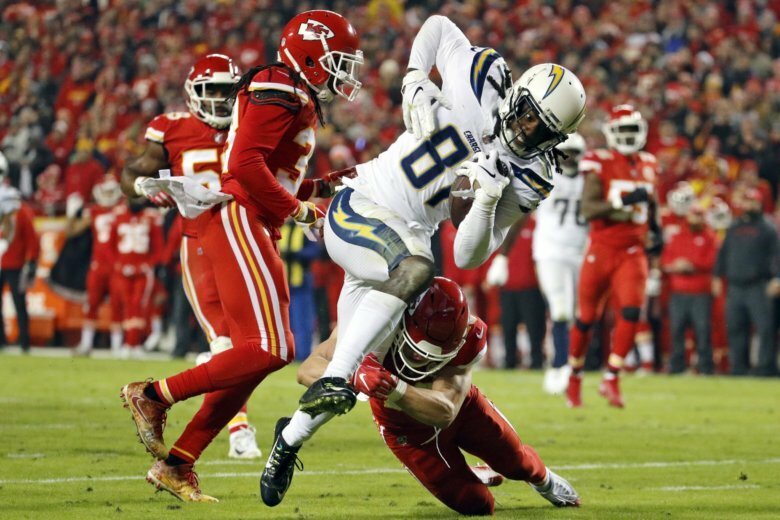 He became the first Chargers receiver since Tim Dwight in 2002 to have a rushing and receiving touchdown in the same game and he caught the game-winning, two-point conversion as Los Angles broke a nine-game losing streak to Kansas City. Rivers isn’t wrong when he says Williams has had plenty of big catches. According to Sportradar, 31 of Williams’ 37 receptions have gone for first downs. The 83.8 percentage is second in the league to Tampa Bay’s Chris Godwin, who is at 84 percent (42 of 50 catches). Coach Anthony Lynn said Williams’ biggest improvement has been route running. The 6-foot-4, 220-pound Williams used his size to his advantage in college but needed to do more to be consistently successful in the NFL. Williams is the team’s leading receiver on post routes (nine receptions) and corner routes (six catches). Three of his touchdowns in the red zone have been on corner routes, where he has been able to use his size to his advantage. Rivers agreed but also was quick to say that Williams did come in with a solid understanding of football, but that his growth is similar to all young players transitioning from college to the NFL. Williams and the Chargers will face a stiff test against a Ravens defense that is ranked as the top unit in the NFL and is third against the pass. Los Angeles has clinched its first postseason berth in five years while Baltimore has a one-game lead for the final spot in the AFC. The Chargers are tied with Kansas City for the AFC West lead but need to win out and have the Chiefs drop one of their remaining games to wrap up the division and home field throughout the playoffs. “I’ve played in a lot of big games in college and tough atmospheres. I feel like I am prepared for what is coming up,” Williams said.